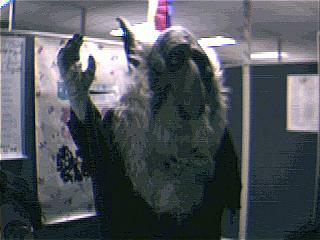 In 1996 when I was working at Silicon Graphics I was "Grendel" the Troll. I used my troll mask, and was also able to use the newly added features, hands and feet. Here is what I looked like, and I had a lot of fun at work and visiting my fiancee's work and the local mall. Dozens of kids and adults crowded around wanting to meet me, and have their pictures taken with me.